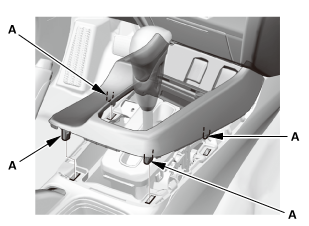 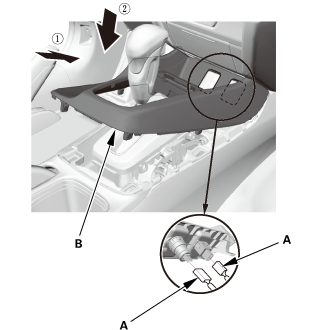 Remove the center console (A), in the numbered sequence shown. 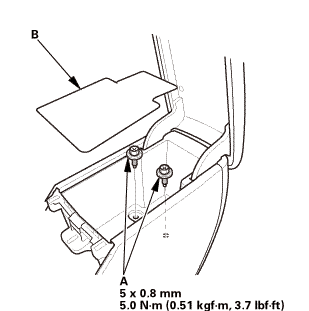 Shift the shift lever to R.
Insert a 6.0 mm (0.236 in) pin (A) into the positioning holes (B). 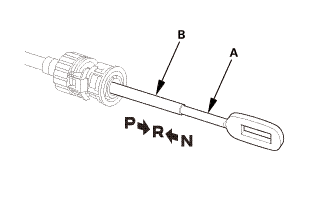 NOTE: Use only a 6.0 mm (0.236 in) pin with no burrs. 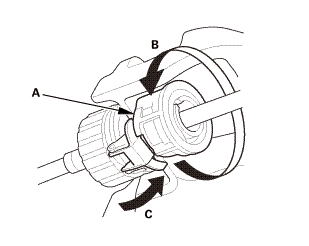 Remove the nut (C) securing the shift cable end (D). 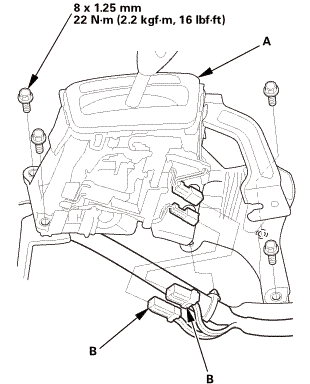 Unlock the retainer lock (A). 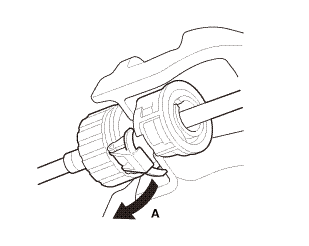 Rotate the socket holder retainer (A) counterclockwise (B) until it stops, and push the retainer lock (C) into the socket holder retainer to lock the retainer. 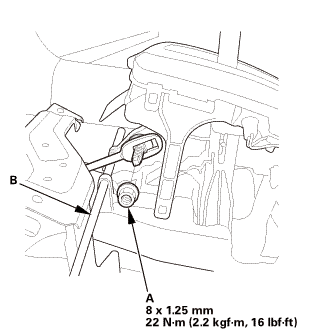 Slide the socket holder (A) away from the bracket as shown to remove the shift cable (B) from the shift cable bracket (C). 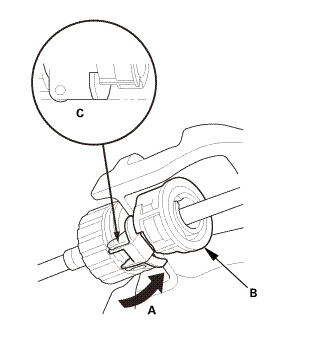 NOTE: Do not remove the shift cable by pulling the shift cable guide (D). 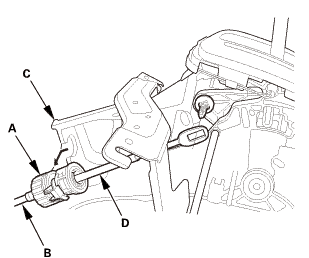 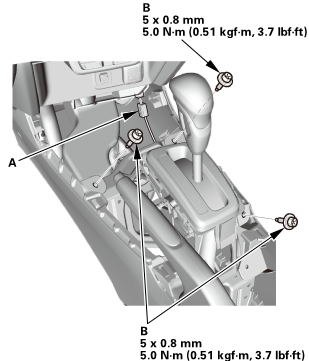 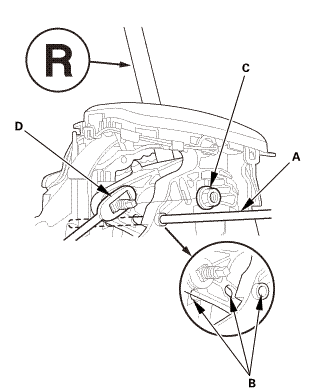 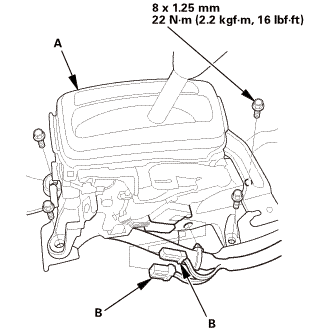 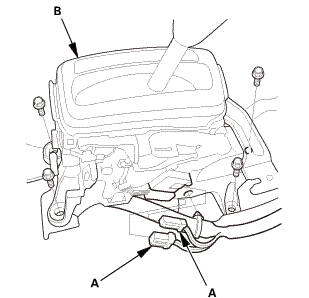 Remove the shift lever assembly (B). 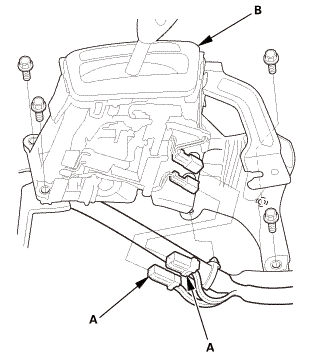 Install the shift lever assembly (A). 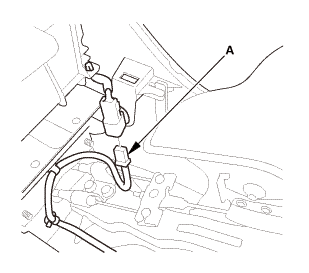 Push the shift cable (A) until it stops, then release it. 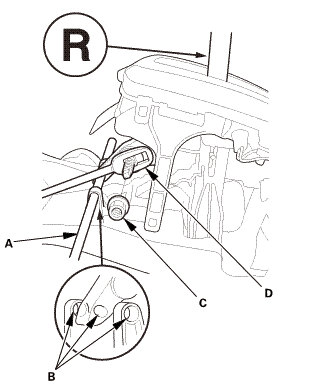 Pull the shift cable back one step so that the shift position is in R.
NOTE: Do not hold the shift cable guide (B) to adjust the shift cable. 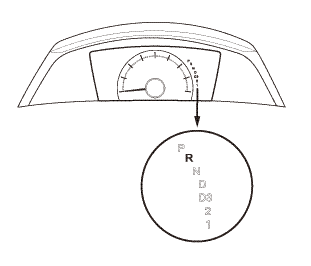 Check that the R position indicator comes on. 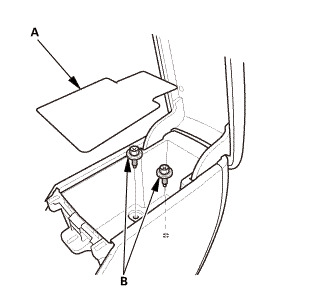 Align the shift cable slot (A) between the socket holder (B) and the socket holder retainer (C) with the opening (D) in the shift cable bracket (E), then slide the holder into the bracket while installing the shift cable end (F) over the mounting stud (G) by aligning its square hole (H) with the square fitting (I) at the bottom of the stud. 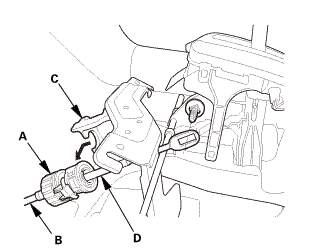 Do not install the shift cable by holding the shift cable guide (J). 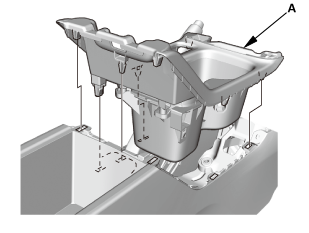 When the socket holder is installed in the shift cable bracket, the retainer lock is unhinged and releases the holder retainer lock, then the holder retainer returns under spring force to secure the shift cable. Push the retainer lock (A) fully to lock the socket holder retainer (B), and make sure that the retainer lock fits into the hinged-joint (C). 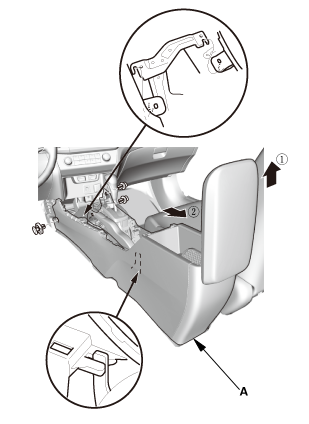 If the retainer lock does not fit with the edge of the hinged-joint, rotate the holder retainer counterclockwise while pushing the retainer lock until it locks. 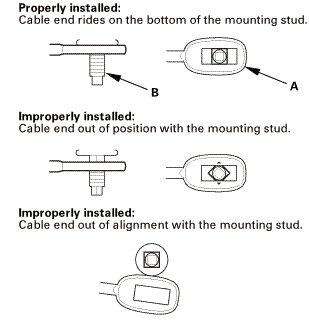 Install the shift cable end nut (A). 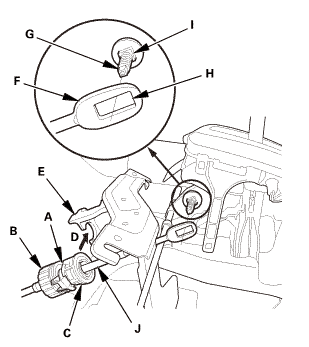 Remove the 6.0 mm (0.236 in) pin (B) that was installed to hold the shift lever. 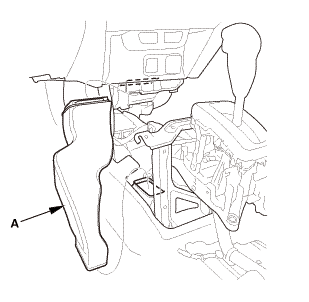 Move the shift lever to each position, and check that the A/T gear position indicator follows the transmission range switch. 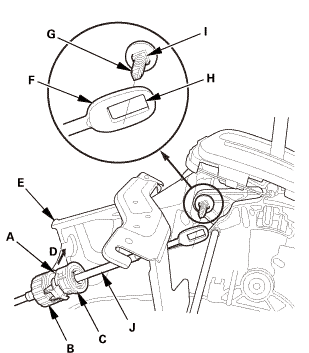 Check that the shift lock works properly. 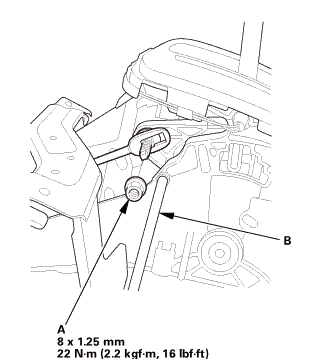 Push the shift lock release, and check that the shift lever releases. 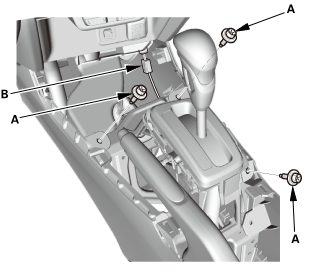 Also check that the shift lever locks when it is shifted back to P.
Install the center console (A), in the numbered sequence shown.